Skaara was a young Abydonian, son of Kasuf and brother of Sha're. He met and befriended Jack O'Neill. After been possessed by the Goa'uld Klorel and freed by the Tok'ra, he came back to Abydos and died by the end of 2002 by the hands of Anubis' Jaffas. He has been ascended just after his death by Oma Desala. Skaara is the son of Kasuf, the Abydonian leader, and the brother of Sha're (Stargate). On Abydos, Colonel Jack O'Neill, Daniel Jackson, Kawalsky and Brown check an open mine where many indigenous are working in. Among them, Skaara is watching them coming. As they introduce themselves, all of them bow down when the see Daniel's pendent. O'Neill asks Skaara to stand up and shakes his hand. Skaara, scared, runs away calling Kasuf in his native language. Later, he comes back with Kasuf, the Abydonians' leader. During the travel to the big city, Nabeh, one of Skaara's friends, is playing with the handkerchief Daniel Jackson used to blow his nose. Skaara, upset, takes back the handkerchief from Nabeh and gives it back to Jackson. As a sandstorm rises up, every Abydonians hurry to shut the city's doors. Paniced, O'Neill and his team prepare to defend themselves. Skaara, calmly, shows O'Neill the sandstorm from the city's walls. O'Neill then realizes they only want to protect themselves and calms down his team, especially Kawalsky. During a banquet offered to the guests, Daniel Jackson tastes a cooked armour-skinned animal, finding it tastes like chicken and starts imitating its behaviour. Then everybody including Skaara laugh at the scene. Skaara is sat on the window's border of O'Neill's room, observing him taking a cigarette, lighting and smoking it. O'Neill sees his wonder and shows him how to use the lighter. O'Neill throws the lighter to Skaara who learns pretty fast. Then, Skaara reaches a cigarette, lights it and mimics O'Neill's gesture. When Skaara start to inhale a big drag and tries to hold it, he coughs and shout, dropping the cigarette. O'Neill realizes this joke was pretty stupid. When Skaara gives back the lighter to O'Neill, the latter offers it for good as a gift. Skaara sees a rifle lying on O'Neill's bed near the cigarettes and tries to pull it. O'Neill, horrified, yells at him. Scared, Skaara flies off. Later, Skaara shows the lighter to his friends, explaining how it works. Nabeh touches the flame with his finger but burns himself. Skaara witnesses when Kawalsky salutes O'Neill. Then O'Neill comes to the kids and tries to communicate with them about Daniel Jackson. Taking that for a game, the kids mimic O'Neill's gestures. Then Skaara realises he was talking about Jackson when O'Neill sneezed and begins to imitate chicken. He asks for Jackson's jacket and brings it to the alien domestic animal to sniff it. The animal recognises the smell and take them to a cave where the find Jackson and Sha're. When Jackson, O'Neill, Brown and Kawalsky leave the cave to the pyramid, Skaara and his friends follow them to the pyramid and assist the capture of the team by Horus guards. Later, they reach the team's base camp and find riffles. Then, two death gliders come out Ra's mothership to the city. When Skaara and the boys arrive to the city, they only find destruction. Sha're asks Skaara for Daniel, but Skaara is unwilling to answer. He finds his father, recovering a dead body with his cloak and telling him they should not have helped the strangers. Later in the cave, Sha're explains to Skaara and the boys that they can no longer live as slaves. The next day, all the Abydonian population assists to an execution ordered by Ra. The executor is Daniel Jackson and the executees are O'Neill, Kawalsky, Ferretti and Freeman. As Daniel is about to use a staff weapon against them, Skaara uses the lighter with the sun to show Jackson their presence. Jacksons fights back against Ra. Skaara and the other boys start to shoot into the air with the riffles, generating panic among the crowd. Back in the cave, Skaara proclaims a victory and shows the team's weapons. O'Neill asks Kawalsky to remove the weapons from the kid's hands. Later, as Jackson realises that Sha're has been given to him by the elders as his wife, Skaara closes the curtain to give them privacy. The next day, Skaara draws a sketch representing a pyramid and the three Abydos moons. Jacksons sees it, connects the moons and determines the point of origin. In the mine, after a firefight with Horus, Kasuf argues with Skaara. Skaara, upset, says they won't live as slaves. Later, as some caravans climb the ramp to the pyramid, Skaara is in one of them, with Ferretti, Kawalsky and others Abydonian boys. When the first caravan is trapped inside the pyramid, all the second caravan try to come inside, unsuccessefully. Two death gliders fly out of the ship and start to fire on Skaara and the small troop. They hide behind the remains of the caravan. Then Skaara witnesses powerless the death of Nabeh. Finaly, out of ammunition, Kawalsky surrenders, followed reluctantly by the others, including Skaara. But, as all seems done, Kasuf and all the Abydonians appear at the top of the dunes, making an attack against the Horus guards. Pleased, Skaara and the other boys cheer. After the destruction of Ra's ship in Abydos orbit, Skaara and the other boys salute O'Neill, mission accomplished. Amused, Kawalsky and Ferretti salute as well. O'Neill returns the salute. Later, as the team is ready to gear up, O'Neill shakes hands with Skaara. Over a year later, in the Stargate Command holding room, a retired Colonel Jack O'Neill meets Major Kawalsky. They talk about the Abydonian "kids" as they are the reason they kept the secret in the mission report. Skaara is mentionned as he reminded O'Neill of his son when he saluted him. After receiving confirmation that Daniel Jackson is still alive on Abydos, a mission team is set up, using the Stargate to reach the destination. Inside the Abydos pyramid, a milicia "welcomes" them, but Daniel Jackson, ask to hold fire. Then O'Neill, goes directly on Skaara's direction, and they salute. O'Neill hugs Skaara. During a dinner, Skaara brings to O'Neill a cup with some beverage. O'Neill smells it, qualifying it as "moonshine". Skaara asks O'Neill to taste it. O'Neill executes himself, but the beverage is quite strong for him. Skaara and his friends laugh as well the other people in the place. Then, Skaara wants to give back the lighter to O'Neill. But O'Neill says to him he gave it to him to keep it. Skaara hesistates then thanks O'Neill. Daniel says to O'Neill that the lighter never left Skaara since. Later, Skaara warns Daniel Jackson the sandstorm has passed. When O'Neill, Captain Carter, Major Kawalsky and Daniel are exploring a chamber with symbols inside, a group of Serpent guards, led by Apophis, come through the Stargate, firing on the Abydonians. Skaara tries to fight back with a machine gun, but the gun jams. Teal'c, one of the Serpent guards, seazes Skaara by the throat and asks him for the gun. For an answer, Skaara split on him. Teal'c takes him to Apophis who declares this young boy is a good choice, a perfect specimen. Apophis subdues him with his hand device. Skaara is taken to Chulak where he is put in jail with Sha're. Later, in the prison, Teal'c comes and chooses Sha're. Skaara tries to fight but Teal'c warns him that his death cannot help her. On Abydos, Skaara joins a meeting with elders in order to raise an "army" against Anubis. Thinking their lives are meaningless against a so powerfull enemy, he is surprised to see an ascended Daniel Jackson encouraging him. Later, SG-1 arrive on Abydos where they meet Skaara. Skaara is introduced to Jonas Quinn. Skaara goes with Colonel Jack O'Neill in the far end of the catacombs and declares that they haven't found the Eye of Ra. 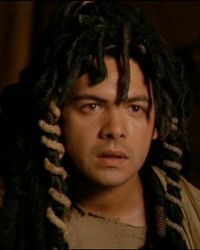 Skaara has been portrayed by the same actor in both the movie and Stargate SG-1: Alexis Cruz. Only him and Erick Avari (Kasuf) kept their role in a Stargate series. Despite the fact they both reprise their respective roles, Alexis Cruz and Erick Avari never played again together in a Stargate SG-1 episode since the movie. Skaara on the official Stargate MGM website. ↑ This scene only appears in the Director's Cut movie. This page was last edited on 21 November 2014, at 12:57.